Silentium (left) and Purify, two great content blockers for iOS 9.
iOS 9 includes a new feature that desktop users have had for a while: content blocking. More conventionally known as ad blockers, this software cuts out all the advertisements and other cruft from web pages, allowing faster load times and a more streamlined experience. Of course, most websites you read these days (including Cult of Mac!) rely on advertising to keep the lights on. Luckily for all of us, most new content blockers let you whitelist specific sites so you can continue to help them pay their bills. I’ve tested both Purify and Silentium Silentium— they both offer whitelisting, block ads, and keep ads from tracking you, though Silentium offers social media button blocking, and has some more advanced regional filters. Update: Marco Arment, of Instapaper and The Magazine fame, has just revealed Peace, his own take on content blocking for iOS 9. Arment has removed Peace from the App Store. Whichever app you choose, however, you’ll download and install it from the App Store like you would any other app. Install, then toggle ON your content blocker. Once installed, you’ll need to launch Settings with a tap, then tap on Safari. Swipe down to the General section. 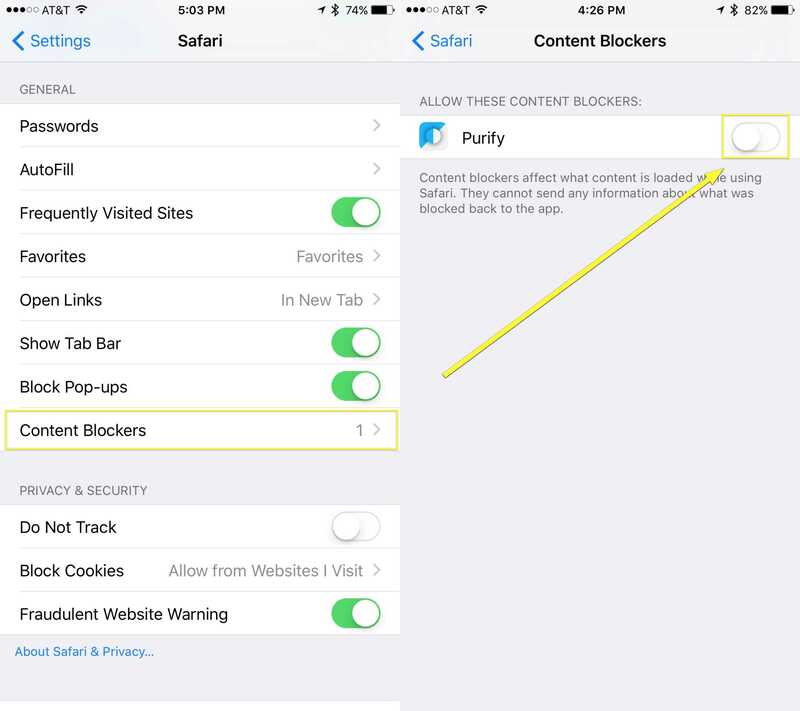 At the very end, just under Block Pop-ups, you’ll see Content Blockers. You will not see this if you haven’t yet installed a content blocker app. 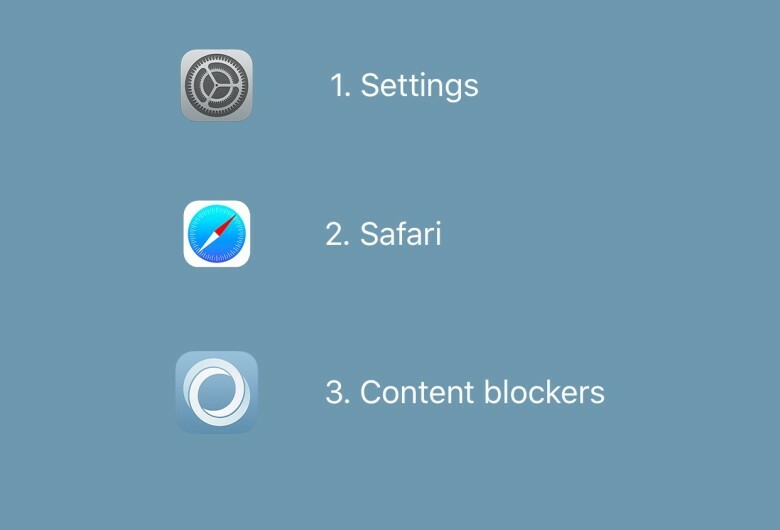 Tap on the Content Blockers area to see a list of all the ad-suppressing apps you’ve installed. Simply toggle the specific app you’d like to enable to ON, and tap out of Settings. Make sure to put us on your whitelist! Next, open mobile Safari with a tap and navigate to a page you’d like to add to your whitelist. We suggest starting with Cult of Mac, of course. Tap on the Share button at the bottom of Safari (the rectangle with an arrow pointing up out of it), then swipe along the bottom row to the More icon (three dots). 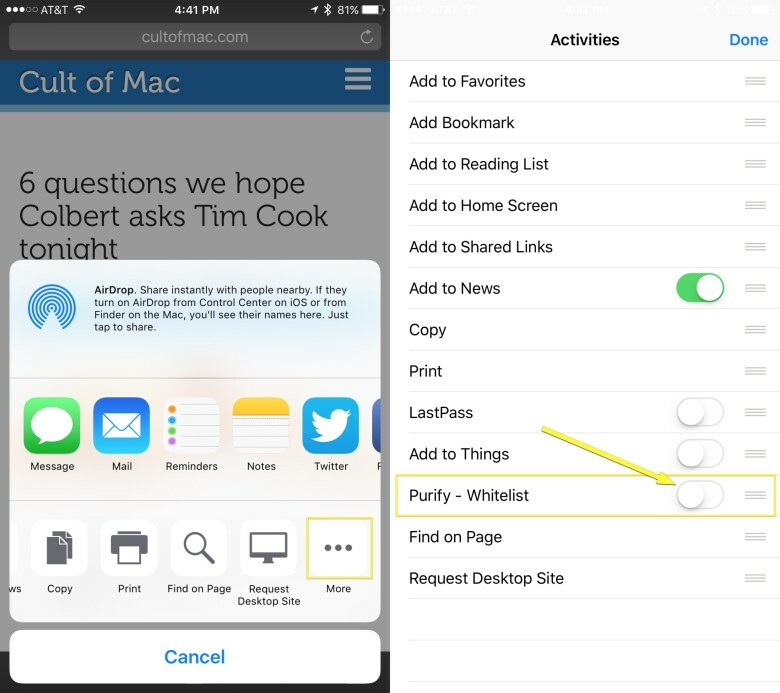 Tap there, and then you’ll see, near the bottom of the Activities screen, “Purify – Whitelist.” If you’re using Silentium, you’ll see a toggle for that. Toggle this setting to ON, and you’ll allow Cult of Mac (or whichever sites you add) to load advertising to help fund the amazing content you read daily. Hooray! Each app has its own tutorial, too. We’ll continue to check out different content-blocking apps to see which are most effective and powerful, so stay tuned. Let us know if you find any you like — we’d love to check them out.